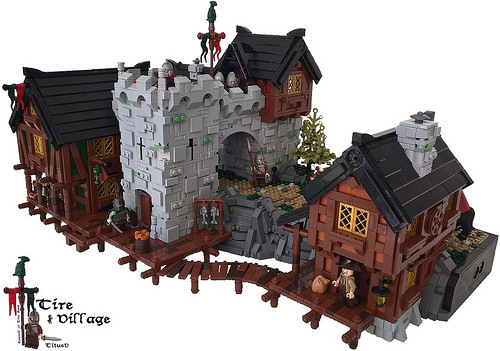 Gatehouses are quite a popular theme in LEGO castle builds, but this port village gatehouse by Titus Verelst still manages to bring something new to the table, surrounding the gatehouse with a village suspended on logs. It makes a nice composition with the rooftops and curved path, adding just enough minifig action to bring the scene to life, despite the bleak colour scheme. I do wish the builder had added water around the village, or at least used some clever digital tricks or blue paper as a stand in.